The RICO statute, or the Racketeer Influenced and Corrupt Organization Act, was designed by the federal government as a measure to fight against organized crime in the United States. Being convicted of violating RICO can result in serious penalties. People who face RICO charges often benefit from obtaining the assistance of an experienced defense attorney to navigate this complicated body of law. If the actions that are committed by a person are isolated from a group of people, a person can not be prosecuted under RICO. To constitute a pattern of illegal activity under these offenses to satisfy a RICO offense, the activity also must include two or more illegal actions that are committed within 10 years of one another. While RICO was once commonly used to prosecute members of the mafia as well as the Hells Angels, today the law has a number of applications for prosecution against illegal operations. Before RICO became an effective law, one of the most common defenses raised by individuals engaged in organized crime was that they should not be convicted of an offense because they did not commit the act themselves. Under RICO, however, an individual can be convicted of an offense if they ordered another individual to commit the crime. Being convicted of a RICO violation can cause a person to end up facing a 20-year prison sentence (and sometimes even a life sentence) as well as a $250,000 fine (and more if they are convicted of the offense). A person who is convicted under RICO also must forfeit all of their interest in the property involved in the criminal offense to the government. Not only can this seizure have an impact on a person’s future, but it can also make it difficult to defend against RICO charges which is why it is often critical to obtain the assistance of an experienced criminal defense lawyer. If you are faced with RICO charges and need help responding to these matters, you should not hesitate to speak with an experienced lawyer. 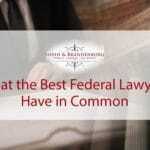 At the Federal Criminal Law Center, we have helped numerous people respond to RICO charges because we understand just how serious the associated penalties can be. Contact our law office today to schedule a free consultation during which time we will discuss your available options. 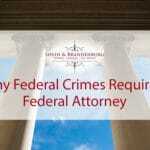 This entry was posted in Criminal Defense, Federal Crimes and tagged organized crime, racketeering, RICO. Bookmark the permalink.